Words cannot define the joy and excitement the whole of India experienced on the 2nd of April 2011 when the Indian Cricket team led by MS Dhoni won the Cricket World Cup 2011. 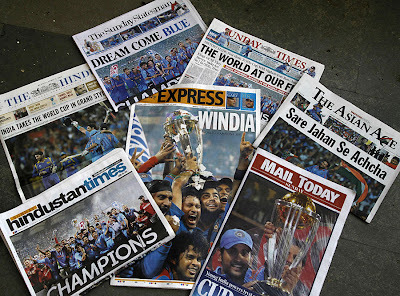 After a nerve wrecking final match with Sri Lanka, India won the cricket world cup for the second time after 28 years. Well, I am sure it is and can't imagine how it must be to take the pressure of the expectations of a 'cricket crazy' nation. But, like every Indian I prayed and prayed for the win. Well, God would have had a tough time if he had to turn down the prayers of 1.2 billion Indians. News channels and newspaper have been flooded with the news of the world cup win and there are celebration everywhere. I feel so proud myself being an Indian and salute to 'The Men in Blue' for making the long cherished dream come true and for the joy and happiness they have brought to the whole of the nation. I didnt see the entire match either.Nerves !. But yeah,What a fantastic match ! I too went thryt thru the same emotions! Excitement,fear, thrill & finally pride for the Men in Blue!!! It was a thrilling match for sure!